:: View topic - How to remove table in MS Word but keeping the text inside? How to remove table in MS Word but keeping the text inside? Posted: Mon Jun 26, 2017 11:25 am Post subject: How to remove table in MS Word but keeping the text inside? So you want to remove the table in your word document while the text inside the table should retain its structure as it is, right? Select the table by clicking on the small plus sign on the top left corner. Once you select the table, two new menu options appear on the Menu bar – Design and Layout. It retains the structure almost as it was. 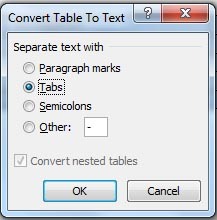 You can, however, use Tab or Space bar to rearrange the text.